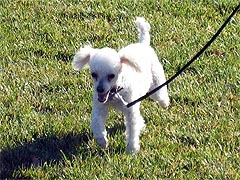 Hi there: I sent you a picture of our poodle who we adopted from you on 11/29/08 a few days ago and thought I would send one via your website just to make sure you got it. Doris was the foster mom. Lucy Lou is doing well and really a pleasure to be around. She weathered the Christmas crowd extremely well.